The world’s last charismatic megafauna are being exterminated. This slaughter is taking place with particular gory ferocity in Sub-Saharan Africa, for reasons linked to the continent’s enduring poverty and vulnerability to global regimes of resource exploitation. 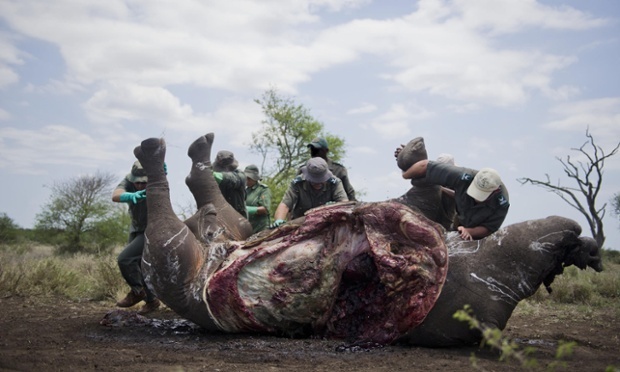 An article in The Guardian describes the record-breaking tally of rhino deaths in South Africa. So far this year, 558 rhinos have been killed. The slaughter is on track to exceed last year’s horrendous tally of 1,004. Articles such as the above one often mention that animals such as the rhino are killed for Asian markets, where the horns are (falsely) believed to augment male sexual potency. Unfortunately, these articles seldom mention the decades of structural adjustment programs – administered by Western-dominated institutions such as the World Bank – that have made sub-Saharan nations and peoples vulnerable to the globe-girdling trade in illicit megafauna flesh. 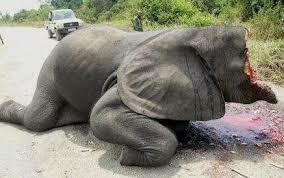 Elizabeth Kolbert’s article in The New Yorker offers a similarly decontextualized analysis of the contemporary slaughter of elephants such as Satao (pictured above). Her article puts these tragic deaths in the context of the worldwide extinction of megafauna since the Neolithic revolution. What she does not mention, however, is the culture of European colonial big-game hunting that was responsible for the vast majority of such extinctions around the globe. Nor does she talk about how Western policies of “development” are linked to enclosures of land and resources around the world, encouraging strapped locals to plunder the remaining resources for global markets. A lot of work remains to be done to place this slaughter in adequate political-economic context. Tragically, animals like the elephant and the rhino may well be effectively extinct before the policies that are promoting their slaughter are reversed.